Found this discussion of Trigun on the atheism discussion board of Reddit today: "Where Do You Get Your Morals?" 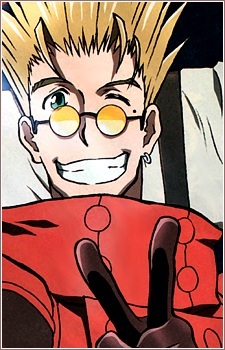 "Trigun taught me a lot about what life is worth. It taught me that it is NEVER okay to take life, but that doesn't mean it isn't necessary some times. We must accept that by taking life, or having life taken for our benefit, sullies our "soul" and we should aspire to die with as clean of a "soul" as possible. I thought I was the only person who watched Trigun for morals. I am shocked. I loved the whole thing about you cannot save all the butterflies because then the spiders would die. Honestly, my morals were formed from watching anime, especially Rurouni Kenshin and Trigun. Trigun has ethical/philosophical messages at the end of each episode (if I remember correctly) during the preview for the next one, and they are very good! I'm sure someone has transcribed them somewhere, because they are that good. It's a beautiful anime. The ethical dilemmas presented in anime are a great resource for kids, and I'm so glad I had the chance to experience it when I did. I feel like this is what separates anime from Western cartoons and is what made me the person I am today. Honestly, I will try to pass my love for these influential anime on to the next generation. Thanks for posting this. It's fascinating to see that others have learned morality like I did! Oh, and Peace Maker is the most recent anime I've re-watched, and it is nowhere near Trigun's level. I was actually a little disappointed with it, so I'm not sure why that person recommended it as an introduction to Trigun.